Perth is an isolated metropolis, poised on the edge of the Indian Ocean and the arid interior of the Australian continent, distant from the larger and more closely linked cities of the Australian eastern seaboard. Ideas which form here do so as exotic fruits in an oasis. Ideas from abroad take some time to arrive. The Urban Screening brings together ideas from abroad and at home, for cross-pollination of locale and discipline. There is a broad range of architectural thought and production under way in Perth, activity from a network of people and groups who have a strong influence on the form, nature and character of places we live in. Much of this activity is invisible to those not directly involved, and the products are often those of the background, forming the framework of the life of the city. The Urban Screening reveals the excitement, plurality and richness of ideas about living and working in the city which are being explored and produced by the architecture profession, artists, students, academia, and government. This inclusive view of architectural work includes public and private buildings as built, unbuilt, and speculative, video art, videos documenting art, art production and performance, urban design, landscape, infrastructure, design process material, advocacy and policy development. The 2014 programme was planned for two large screens, with films chosen to suit each one; the Northbridge Piazza Super Screen* is a venue with an audience who will sit to watch longer, more informative pieces. The Perth Cultural Centre Screen, situated in an arts precinct allows for more risk taking, and calls for shorter films with maximum visual engagement for the walk through traffic from nearby transit hubs. 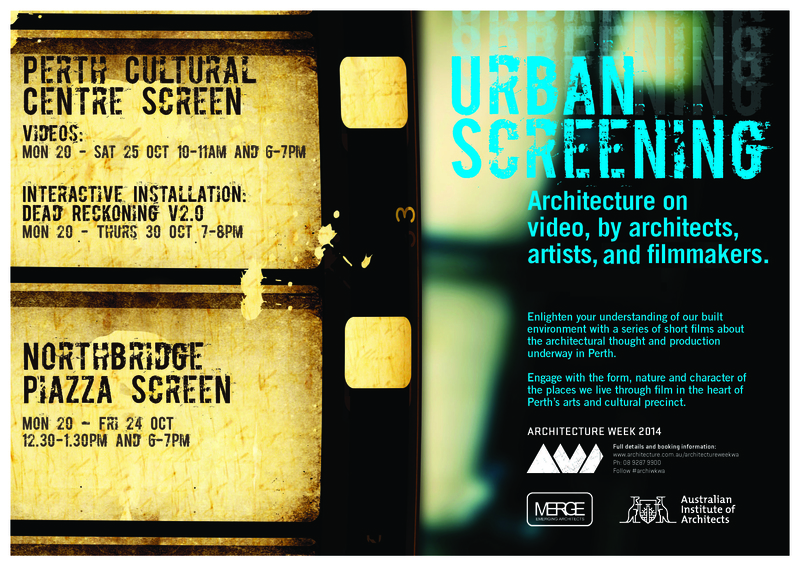 The Urban Screening Curators would like to warmly thank all the contributors who made their work available for inclusion, the screen curators of the Northbridge Piazza Super-Screen* and Perth Cultural Centre Screen, the City of Perth, the Metropolitan Redevelopment Authority (MRA) and the staff at the WA Chapter of the Australian Institute of Architects. *Last minute technical difficulties prevented the showing of the Northbridge Piazza Super Screen programming, which was disappointing for all concerned. We apologise for any inconvenience. Description: Dead Reckoning is an part of a larger experiment into the potential application of data gathered by pervasive computing in the design of public space. The work has involved the development and prototyping of software and hardware systems that process and visualise information gathered within the urban environment in order to generate unique interactive experiences. Version 2.0 is the latest iteration of the Dead Reckoning software. The software utilizes video surveillance data to actuate an interactive, simulated architectural façade. The future development of this software will aim to expand the capabilities and application of these kinds of architectural interface. Two areas currently being explored are the mapping of contextual information onto the human body through the use of exo-sensory prosthesis and the development of larger-scale urban design tools that can be informed by the aggregative and real-time collection of site data. Description: The last climber alive must keep herself fit and ready explores the ultimate freedom and intense futility of being the final human occupant on earth. Set in an immense and unkempt urban architectural model, the scene for the last person alive is simultaneously a utopic and dystopic space; the city is shown in its ideal form, untainted by human occupation, yet neglected, unfulfilled and inert. The final inhabitant of the planet is cast as a rock climber, whose new geological arcadia is the inexplicably abandoned city. The lights of the city dim and change colour in ghostly automation as the last climber passes her time looking for other signs of life, keeping fit, and scaling the city’s buildings. In this city she is liberated from all rules, yet her rebellion against normative behaviour becomes meaningless in a paradigm of post-humanity. Description: Thigmotaxis is a vertiginous, fast paced experimental film – a manifesto of city and suburban transgression through bouldering and parkour – which plays out to heart-racing effect with a polyrhythmic percussive soundscape. Coates draws on her background in urban climbing and interest in architecture to provide new perspectives into Perth’s build environs. Filmed over a series of early-morning guerrilla-style interventions with the city’s public art and architecture, Thigmotaxis brings together collaborations with climbers, parkour traceurs, video artists and drone pilots. As well as local experimental musician Stuart James, who accompanied the artist to her climb locations to build up a library of field recordings of the sound of the body’s contact with artworks and architecture. Description: A film based on an art project which took place in Geraldton in 2013. 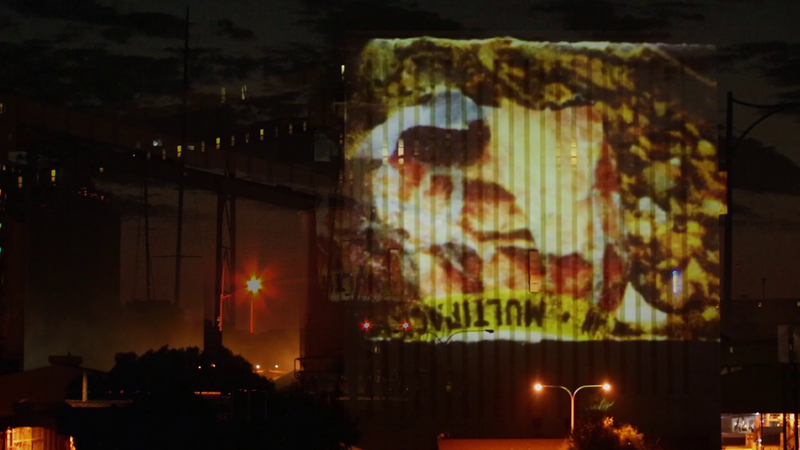 With narrative development by Annabel Smith with Peter Docker, collaboration with students from Mid-West schools co-ordinated artists Rose Holdaway and Anthea Da Silva, artists Sohan Ariel Hayes and Cat Hope created vision which was projected with analogue cell equipment onto a 13 storey Co-operative Bulk Handling (CBH) silo at Geraldton Port, with sound simulcast on Radio Mama 100.5FM. The result is a work of astonishing physical scale, with a mythological presence which weaves together storytelling, speculation, the mystique of large scale urban infrastructure, as a result of a socially enriching process. The film was produced by Dr Anthony Duckworth-Smith, and supported by the University of Western Australia, the Australian Urban Design Research Centre, and the City of Greater Geraldton, with Geraldton Port Authority, CBH Group and Yamaji Art. Description: Winner of the Archiflick 2012 National Architecture Awards Short Film Competition. A film about the Perth Cultural Centre Amenities, an award winning project by Coniglio Ainsworth Architects. Description: Kyle Hughes‐Odgers recently completed a major public art commission for the Perth Airport. Painting 9 walls (80m x 6m total) across the Cogen building which is located between the Perth International Airport and the T2 complex. This film documents the process from start to finish. It features a mixture of time‐lapse, stop motion and HD/4K video capture. Shot on Canon 7D, Pansonic GH4 and multiple Go pro cameras. Final Render output is 1920 by 1080 at 25p. Sound quality is 48khz/16 bit Stereo WAV file. Description: video portrait of the North Perth House (or Lake House) designed by Jonathan Lake (Jonathan Lake Architects) for his family of 4. The house is an exemplar of compact inner city living, raw finishes, integration with the garden and clear formal ideas expressed in the work. Description: The Armadale Landmark Building is a 5 storey office development for the City of Armadale that will accommodate the City’s Administration department on the upper levels in addition to the Department of Child Protection on the lower levels. This short film illustrates the construction sequence through 3D diagrammatic mass modelling, concept rendering, IES/sun shading analysis animation, wire frame animation and time-lapse photography. Description: Curtin University Building 410 will be a state of the art Learning and Teaching building which will form the first of many visionary initiatives by the University looking to the future. This film depicts the progress of the project from site analysis to design development stage. The illustrative techniques implemented in this process include hand sketches, building information modelling, and computer generated renders. 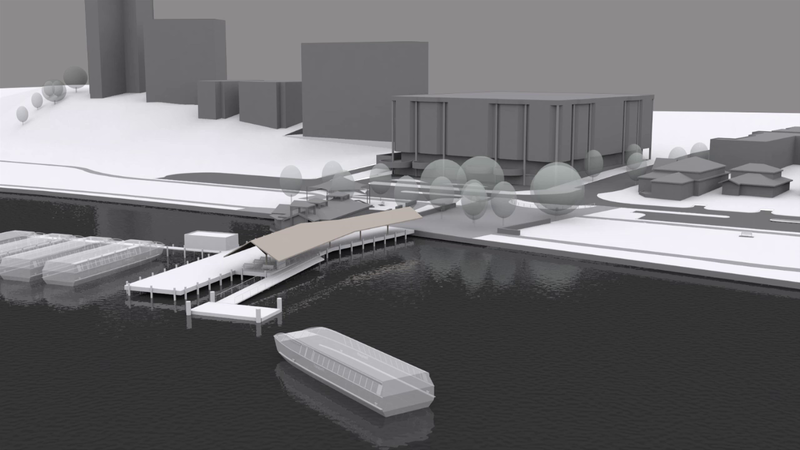 Description: The Mends Street Jetty project focused on several concepts for the Upgrade of the South Perth Ferry Terminal. This film incorporates hand sketches juxtaposed with neutral tone clay rendered diagrammatic animation to illustrate site analysis studies and concept design options. Description: Through laser technology, an existing buildings can be scanned to generate a digital ‘cloud’ of geometrical points. This method of Building Information Modelling makes it very easy to visualise complex older buildings. Scan resolution can be as accurate as 1 point of data every 3mm and, at up to 2,000,000 points of data per second, can be more time and cost effective. Description: The Burns Beach to Mindarie bike track is providing coastal access between the two communities with minimal environmental impact. Experience the weaving through sand dunes in a series of views; first person perspective of the red bitumen bike path,close-up camera perspective of the rider, animated aerial flythrough, and tracker type animated plan diagram. Description: At the centre of Yas Island’s entertainment complex, Yas Waterworld is the largest waterpark in Abu Dhabi. GHD Woodhead was engaged to provide Building Information Modelling and design coordination services during the construction phase. This animation was created using Navisworks, a tool that the practice regularly uses to coordinate building services, enable “Safety in Design” reviews, and publish interactive visual presentations. Description: Brookfield Place is a new commercial and entertainment precinct that has transformed the Perth central business district by bringing life into an area that was neglected and void of activity. Description: It’s the hospital that will transform health services in the Australian city of Perth. And the design by the Fiona Stanley Hospital Design Collaboration has been endorsed by the distinguished epidemiologist and paediatrician who the hospital is named after. Description: For many students, moving out of home and into halls of residence is a rite of passage. But how do universities deliver affordable, attractive accommodation for students that also supports the physical, social and academic wellbeing of its largely young population? This video explains how Hassell helped University of Western Australia achieve this balance at University Hall. Description: A stop motion short film that narrates an architectural travel journey through the phases of Expectation, Experience and Reflection. The work juxtaposes a range of imagery (advertising material, personal photography and digital collages) to playfully explore the shifting of perceptions that occurs before, during and after travel. Description: A true example of site responsive architecture, the Karri Loop House in Margaret River was designed around indigenous trees that made special an otherwise ordinary site. This video has been showcased at a Maxxi Museum (Rome) international architecture exhibition. Description: Future Archaeology #1, #2, #3 and three scenarios for a private client who commissioned Orbitalkai and Cartes-Blanches to explore the boundaries of Land Art and archaeology in three different landscapes. They are poetic explorations of the trace left by abandoned artefacts of World War II on tropical islands. Mysterious megalithic artefacts of lost civilisations in the Pacific and the juxtaposition of prismatic sculptured in a recreated European park in Australia. Description: On the 12th of September 2012, at approximately 12.14pm, a pink coloured splash of light appeared on one of the walls of my Fremantle Arts Centre studio. By 12.32pm it was gone. This short video is an attempt to reproduce the phenomenological occurrence I experienced using a fluorescent light, coloured perspex and a timer. The video is shot from a one-point perspective and consists of what appears to be a static view of a sculptural object mounted on a wall. The sculptural object starts to emit a pink light and then the light disappears. The video is intended to be silent, reflecting the quiet, contemplative space of the gallery in which the object was situated, whilst also mimicking the silence or stillness of a photographic image. Description: A time lapse video showing the process from a simple sketch to a 1:20 sectional model, finished with testing of interior spaces. Designed by Sion Bourne to address an affordable small housing solution in Claremont. Description: An animation which was part of the design package for the Beeliar Drive Masterplan. The aim of the production was to illustrate the components and appearance of the architectural insertions from the perspective of a driver travelling through the site. Description: An animation which comprised part of the Australian Urban Design Research Centre’s entry into the CAPITheticAL competition held during Canberra’s centenary celebrations. The film communicates the vision of urban designers Professor Richard Weller and Dr Julian Bolleter for a network of pluralist urbanism around australia, connected by high speed rail and high speed telecommunications into ‘megaregions’. To quote from the competition jury’s comments, they were “struck by the scale of strategic thinking involved in stage 2 and in particular the impact of the submitted video and saw fit to award a Commendation and a $5000 prize”. Description: Unlike other unbuilt projects, The Final Curtain is not about an architectural project that was never realised, rather it is concerned with an examination of the implications of the unbuilding of an existing piece of Perth’s architecture. The creation and direction of this short film has been a collaboration between artist and student and attempts to explore themes and ideas that are concurrent with the work of Jon Tarry in his sculptures and paintings. While the Perth Entertainment Centre no longer exists, this video remains as a reminder of a relic of the city’s past.